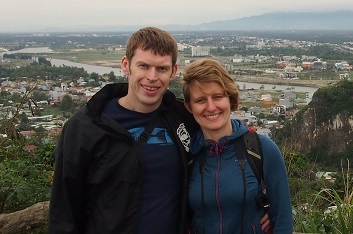 Arriving at Choeung Ek on a warm sunny day, we walked through a picturesque field of grassy hillocks. 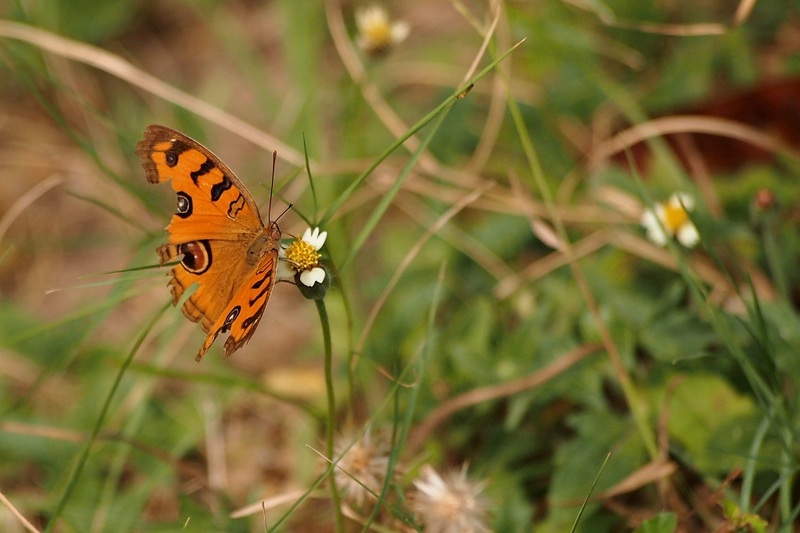 Wild flowers grew up through the grass and butterflies flitted from one to the next. Frangipani trees were in full bloom, their fragrant flowers matching the pristine white stupa at the centre of the park. It was such a beautiful and peaceful place, we began to wonder where the Killing Fields actually were. Then we began listening to our audio guide. It turns out that this gently undulating landscape was in fact a series of mass graves. 129 graves were found at Choeung Ek packed with nearly 12,000 victims of the brutal Khmer Rouge regime. Formerly a Chinese graveyard, remnants of the original headstones poke out of the earth among the mass graves. 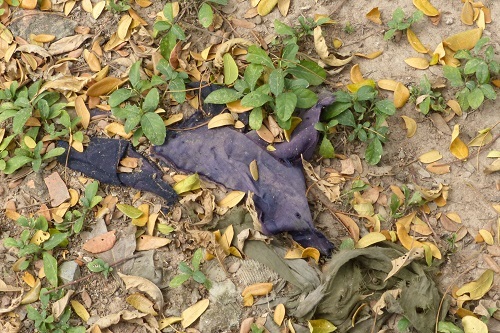 More disturbingly, we also saw fragments of human bone and shreds of blue material, the signature colour of the victims' uniforms. Although most of the human remains were recovered from the graves, every time it rains more appear at the surface. 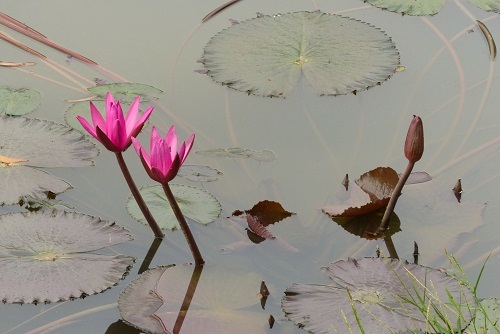 We strolled around a large pond where pink water lilies bloomed and chickens scratched around on the banks. Birdsong added to the tranquil atmosphere. Then we learned that more mass graves lie beneath the water. These graves have not been excavated and will be left in peace. We found some areas enclosed by bamboo fences. 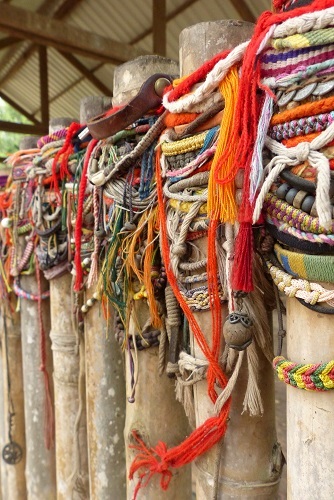 Hundreds of colourful bracelets had been threaded onto the fence posts, some woven, some beaded, and some adorned with coins or shells. Buddhist prayer flags and strings of Japanese origami cranes hung next to the bracelets and we even found a floral teddy bear. These fences marked some of the larger graves. 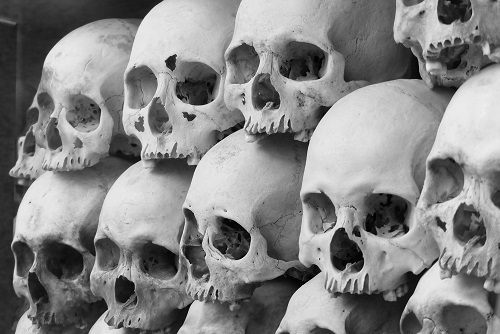 166 headless victims were found in one such grave, all dressed in the black uniforms of Khmer Rouge soldiers. Many of these defecting soldiers had been caught trying to escape to Vietnam. 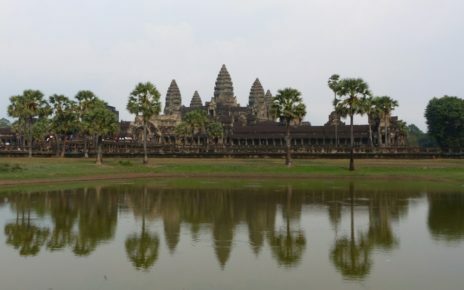 As they were deemed to have “Vietnamese head, Cambodian body”, they were decapitated before being buried. This set a gruesome example to the rest of the Khmer Rouge soldiers. No guns were used at Choeung Ek as bullets were expensive and in limited supply. The Khmer Rouge used any other means available to them. They often utilised farming tools such as spades and hoes as well as hatchets, shackles and knives. After the bodies had been dumped in the graves, they were sprayed with DDT. This was in part to hide the smell but also to finish off anyone who wasn't quite dead. Lush green trees surround the Killing Fields contributing to the peaceful scene. A few of these trees were used by the Khmer Rouge. The first we came across was a tall palm tree with the typical hard, spiky trunk formed from the remnants of previous palm fronds. We learned that these serrated protrusions had been used to cut the throats of some victims. In the centre of the Killing Fields, we saw the old gnarled tree known as the Magic Tree. The Khmer Rouge had hung loudspeakers from this tree. During the day, revolutionary songs motivated (or brainwashed) the soldiers. 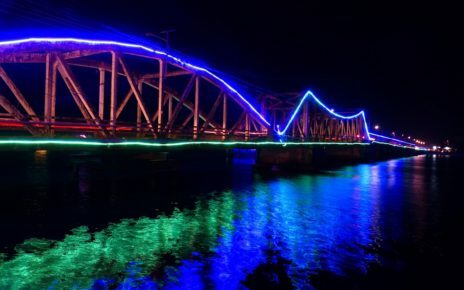 At night, loud music was played to mask the screams of the victims. The local residents consequently had no idea what was going on within the complex. The tree most people will remember however, is the infamous Killing Tree. Another seemingly innocent plant until we had a closer look. 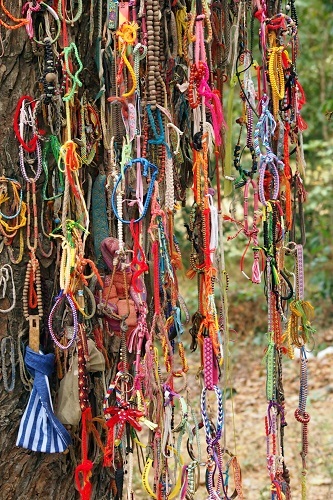 The trunk is festooned with chains of brightly coloured bracelets hung from any available notch or crack in the bark. It stands proud, right next to a mass grave filled with mothers and their children. 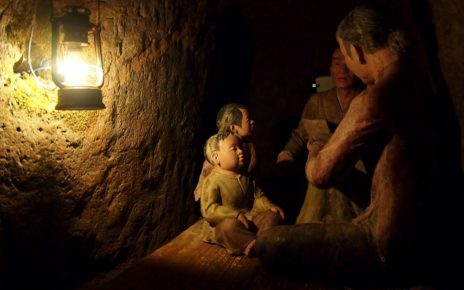 The children were executed first, while their mothers watched. Many had their heads smashed against the Killing Tree. 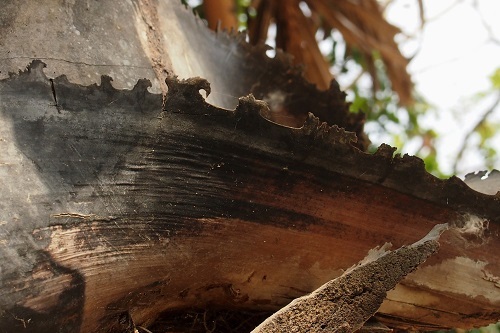 When these Killing Fields were first discovered by a local man, he found blood, brains and bone fragments embedded in the trunk. At the end of our visit, we arrived at the memorial stupa, an elegant tower with large windows and an ornate roof. As we approached, we began to make out the rows of skulls visible through the windows. Inside there are 17 levels, each stacked with piles of bones. Skulls dominate the lower levels but further up there are femurs, pelvises and other remains. It was eerie inside the stupa with rows of silent skulls staring at us. The space for visitors was extremely narrow so there was no escaping the stares as we were unavoidably pressed against the glass. Each bone has been forensically examined and the skulls marked with coloured stickers denoting the cause of death. Many of the skulls were obviously smashed or cracked but some victims died from other injuries. The curators of the memorial site want the world to learn from the horrific story of Choeung Ek. 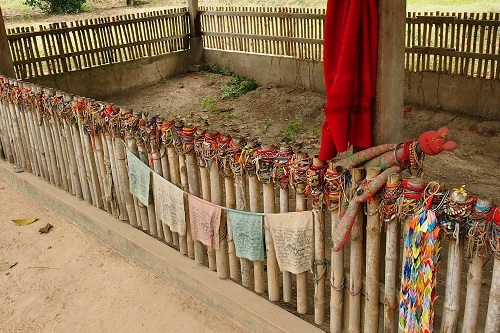 They actively encourage visitors to share their experience and this includes allowing photos inside the memorial stupa. Many of the victims at Choeung Ek came directly from S-21 Prison in nearby Phnom Penh. There they had been tortured extensively until they agreed to sign a fictitious confession. As soon as the Khmer Rouge had a confession in hand, they felt they could justify that prisoner's execution. The victim was promptly transported to the Killing Fields at Choeung Ek. It has been suggested that after all they had endured, death may have been a mercy for some of the victims. Despite the terrible events of the past, the memorial site at Choeung Ek is now a surprisingly peaceful place. Visitors walk around in silence, listening carefully to the harrowing stories on their audio guides. There are plenty of benches, particularly around the lake, that are well suited for quiet reflection. It is a fitting memorial for the victims and an opportunity for visitors to better understand the heinous crimes committed by the Khmer Rouge. 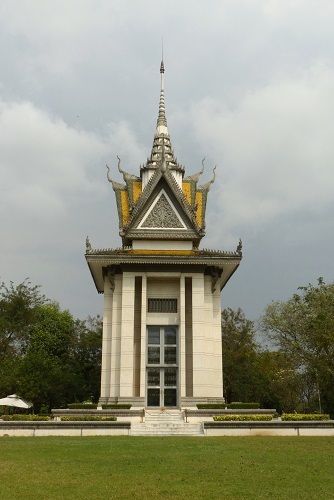 Choeung Ek is the most famous of the Killing Fields, and one of the biggest, but there are many other sites around Cambodia where similar atrocities occurred. Choeung Ek Killing Fields are around 15km from central Phnom Penh. It is possible to cycle or hire a motorbike but probably easier to take a tuk tuk. Tuk tuks are inexpensive and the driver will wait for you while you're inside. 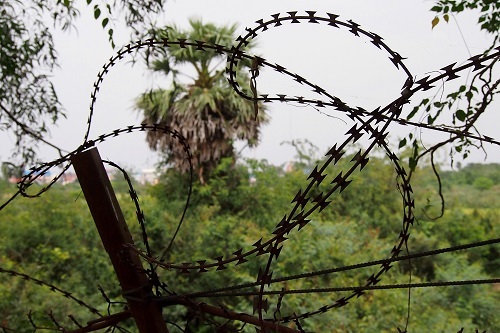 S-21 Prison and the Killing Fields are both important places to visit around Phnom Penh. Both sites are harrowing so you may need time to recover from one before seeing the other. We would suggest visiting them on separate days. I visited the S-21 Prison in Phnom Penh last year, read horrific stories and saw photos in and around the prison cells. After that, I couldn’t face a visit to the Killing Fields, but reading your account has satisfied my curiosity. It’s difficult to know what to say, but without doubt, the most shocking detail is that the fact that mothers were made to watch their children being killed, before they themselves were killed. Hi Howell, We did visit both but not on consecutive days. They were both very different sites but equally harrowing. Scary that something like this could happen so recently, more so because the rest of the world didn’t know what was happening and didn’t believe the stories.